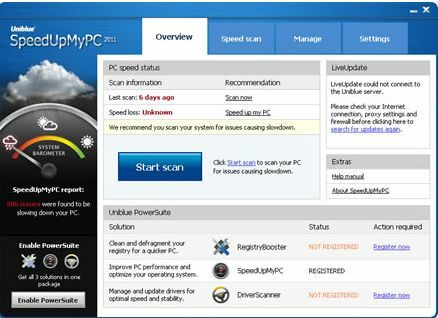 SpeedUpMyPC 2011, from Uniblue, is a comprehensive and easy-to-use computer optimization software. As its name implied, this program is designed to speed up your PC by helping you to easily find out the system settings, unnecessary background processes and junk files that are causing PC slowdowns. It packs a host of powerful professional tools to boost your computer speed and performance by quick addressing and tuning the matters – with just a single click. SpeedUpMyPC 2011 normally costs $39.95 for purchase. 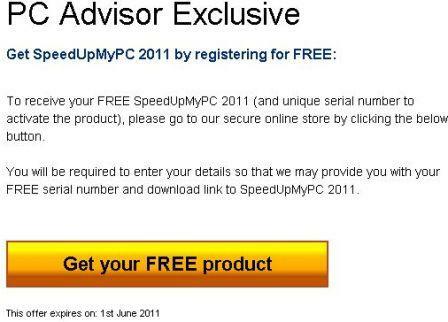 As part of Uniblue / PC Advisior time-limited promotion offer, the interested PC users are now entitled to download the full version of SpeedUpMyPC 2011 at no cost. This promotion will be expired on June 1, 2011! Visit the promotion page and click “Get your FREE product” button to continue to Uniblue online store. 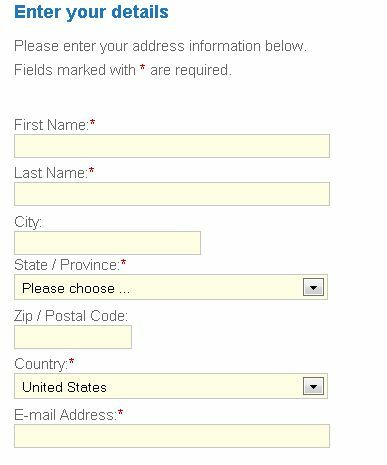 Complete the registration form to obtain your free software. An email (from Uniblue Online Store) which contains a free license serial code of SpeedUpMyPC 2011 will be delivered to your registered email address. Download the setup installer of newest version of SpeedUpMyPC: speedupmypc.exe. Once installed, input your received free license serial key to activate SpeedUpMyPC 2011 to a full version. Uniblue’s SpeedUpMyPC 2011 Windows optimization program that offered in 19 languages including English, French, German, Italian, Japanese, Greek, Spanish, Dutch, Danish, Norwegian, Swedish, Finnish, Russian, Polish, Portuguese, Brazilian Portuguese, Turkish, Traditional and Simplified Chinese, is compatible with Microsoft Windows 7, XP and Windows Vista platforms.